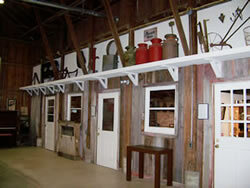 The museum is located in the Fairchild/Knox milk parlor. Displays include artifacts from pre-historic inhabitants of this area, and tribes that followed, including the Kanza and the Delaware. The town's early history, family life, leisure, schools, dairy farming, farming, businesses, and government are also on display. New exhibits and temporary exhibits augment our permanent collections. Plan to stop by the Gift Shop during your visit. We offer two local history DVDs – Traditional Tales of Tonganoxie and Ghost Towns Around Tonganoxie. In addition, there are vintage postcards from Tonganoxie, notecards with pen and ink drawings by Fred Leimkuhler, a local historian who was an active member of the historical society, and other items. 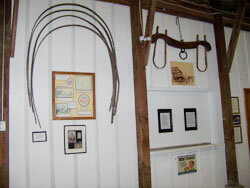 The Fairchild/Knox hay barn and milking parlor are now the Community building and the museum at the Site. The original barn was built in 1901, but burned down in 1928. Frank Fairchild, with his wife, Mattie, formerly of Ulster County, NY started the dairy with 40 acres and 15 milk cows in 1884. Working with Kansas State University, Frank Fairchild became one of the top dairy men in Kansas in the early 1900s. Frank Fairchild, Mattie and their 6-year-old granddaughter, Thelma, were tragically killed in a car-train accident in 1917. The farm passed to their only child, Bessie Fairchild Knox and her husband, Archie. The second barn, built in 1932, still stands at its original site. Part of the original rock foundation supports the barn. Bessie and Archie Knox passed the farm to their daughter, Mildred, who with her husband, Arthur Young, raised white faced cattle on the land until 1976. Mildred Knox Young donated the barns and 6.3 acres of land to the Society in 1987. The hay barn has been renovated with a kitchen and restrooms. It may be rented for birthday parties, weddings receptions, family reunions and other celebrations. Visit our Site Rentals page for more information. 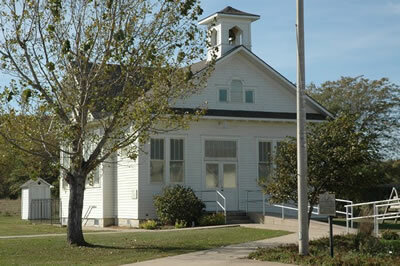 The Honey Valley schoolhouse - district #56 - was organized on March 25, 1869. It was located about a mile south of Tonganoxie on the Gordon Harmon Farm, near County Road 1 and U.S. Highway 24-40. The original building burned down in 1915, was rebuilt the next year at a cost of $1,200, and re-opened on June 21, 1916. This building was moved to the Historical Site in 1991. On September 25, 1999 an open house was held at the school to celebrate the eight years of renovation done by our dedicated volunteers. The Honey Valley School is a typical one-room schoolhouse where one teacher taught the three "R's" to all eight grades. As many as three generations of Tonganoxie students attended this school. Honey Valley School offers a unique setting for students to experience living history. The original Reno Methodist Church was opened August 16, 1891 at a cost of $1,900. Samuel Kelsall and James Phenicie were instrumental in its organization. The first minister was John Jacobs - a Baptist and blacksmith in Reno. The original building was destroyed by fire in 1918 and was immediately rebuilt. It holds a rich history of Sunday services, marriages, deaths, ice cream socials and watermelon feeds. It officially closed in 1993. To save it from being torn down its members sold the building to the Society on June 9, 1993 for one dollar and paid for the cost of moving it to the Site in the spring of 1994. Prior to moving to the TCHS grounds, the Reno Church was used in the filming of "Where Pigeons Go to Die" in 1989. The film was produced by Michael Landon, who also had the starring role. 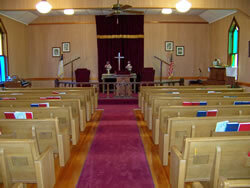 The Reno Church may be rented for weddings, funerals and church or community meetings. The fellowship hall, located in the basement, has a small kitchen, restrooms, and is wheelchair accessible. In the 1930s the Army built several vehicles, including fire trucks, for many of the Army bases throughout the United States. Our truck was built in 1936 by the Army Quartermaster Corp in the Motor Transport Shop at Camp Holabird, Baltimore, Maryland. The pumper was delivered to Fort Leavenworth, Kansas in 1936 and remained in service there until at least 1943. We believe the truck was then taken over by the Army Corp of Engineers and used for some time until it was sold into the civilian market. 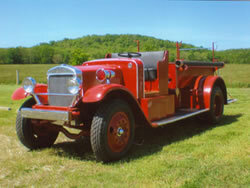 The City of Tonganoxie purchased the truck in 1951 to be its primary pumper for the then- all volunteer Fire Department. The truck served the city until 1961 when it was replaced with a modern pumper fire truck. The pumper is proudly driven in the local St. Patrick's and Leavenworth County fair parades. The fire house also houses a history of major Tonganoxie fires and items from the old fire department.